Back Numbers Every 10 stamps. 2, 3 or 4 digit black numbers top and bottom. Every 270 stamps, the back number will fall on the same stamp with a plate number. Official Announcement On June 1, 2012, in San Marcos, Texas, the Postal Service� will issue a 1-cent Bobcat definitive stamp in one design in a pressure-sensitive adhesive (PSA) coil of 3,000 stamps (Item 789100). The stamp will go on sale nationwide June 1, 2012. The U.S. Postal Service� will issue a 1-cent stamp featuring a bobcat (Lynx rufus), a member of the feline family found across America. 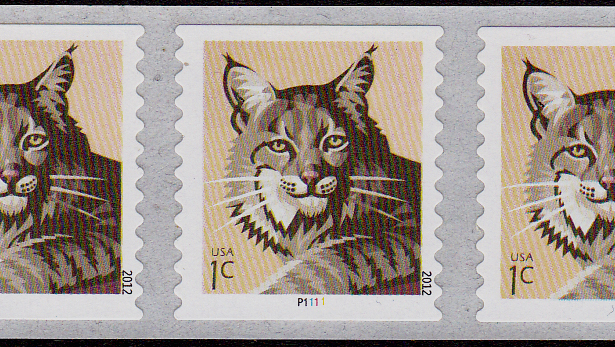 The stamp art is a highly stylized, digital image of a bobcat with golden eyes, pink nose, and fur in shades of brown. Nancy Stahl illustrated the stamp, under the direction of Carl T. Herrman. Security The microprinted "USPS" is on the ear of the Bobcat. Note The 2012 date is in the bottom right hand selvage of the stamp, and is placed vertically. Stamps with plate P2222 were found in August, 2014. Stamp distribution offices (SDOs)/stamp distribution centers (SDCs) will not make a subsequent automatic distribution to Post Offices of this stamp issue. Post Offices requiring quantities of Item 789100 must requisition them from their designated SDO/SDC using PS Form 17, Stamp Requisition/Stamp Return. SDOs requiring these stamps must order them from the appropriate SDC using PS Form 17. SDOs must not distribute this stamp to Post Offices before May 18, 2012. After applying the first day of issue postmark, the Postal Service will return the envelopes through the mail. There is no charge for the postmark. All orders must be postmarked by August 1, 2012.
n 789162*, First Day Cover (1 Bobcat, 1- $0.44 U.S. Flag), $0.89.